Aging brings many physical changes and vision is no exception. 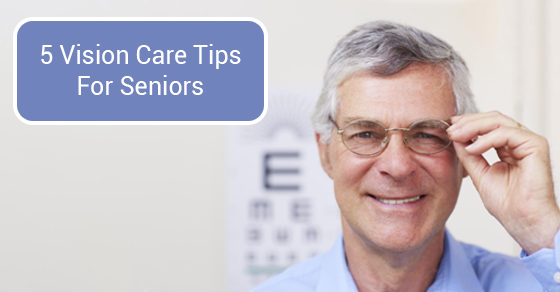 Whether you are a senior or a senior caregiver, maintaining good eye health should be a priority, so let’s look at 5 vision care tips for seniors. Seniors should eat a diet rich in antioxidants like Vitamin A and C. Leafy green vegetables should be high on the list, along with essential Omega 3 fatty acids that promote good eye health. Fish like salmon, tuna, and halibut assist with promoting good central vision. Seniors should avoid too much alcohol and saturated fats. Exercise plays a part in eye health too. Not only is moderate exercise good for the heart, it stimulates blood flow providing oxygen to the eyes. 15 to 30 minutes of mild to moderate exercise several times a week can help improve eye health for seniors. This may be the most beneficial vision care tip of all. We know it’s important to see a dentist at regular intervals to maintain oral health, and the same is true with vision care. A comprehensive eye exam with an ophthalmologist can detect eye diseases or other issues that could inhibit everyday activities. Seniors can develop sight-threatening eye diseases while experiencing absolutely no symptoms. Regular visits to an eye doctor can diagnose and treat Age Related Macular Degeneration, (AMD) before it’s too late. The same is true with Glaucoma, this condition is also hereditary. There is no pain, no noticeable symptoms, and no cure. Unless it is diagnosed early it can result in vision loss. As we age, both vision and balance can be a problem. Take special precautions to eliminate the possibility of falls in the home. Be sure rugs and bath mats are backed with a non-slip material. Hand bars are helpful, along with good lighting throughout the home. Secure railings and move obstacles that could cause falls. Many of today’s seniors are computer savvy. However, sitting in front of one for too long a period can lead to dry eyes, headaches, and eye fatigue. Getting up, walking away for a few minutes, staring into the distance, and blinking are all good practices. Keep over the counter moisture drops handy. These two eye tips for seniors work together. Getting adequate restful sleep keeps eyes lubricated for better vision. A little natural light during the day can help with better sleep at night. Getting some sunlight is also helpful for good sleep patterns, but wear sunglasses when outside. Seniors who like to work in the garden should not only wear sunglasses, but also a hat with a brim to provide extra protection for those precious eyes. If you are a senior caregiver, or a senior yourself, don’t overlook the need for annual eye exams.. There is no reason visual problems should compromise a senior’s lifestyle. Contact C-Care Health Services with questions or if you would like a quote.